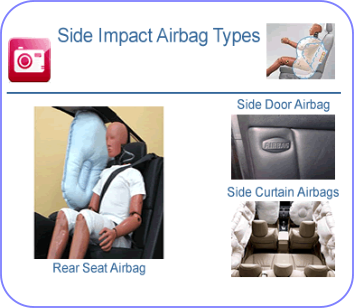 Side impact airbags were designed primarily to reduce head, neck & shoulder trauma. Their success encouraged automotive manufacturers to quickly adopt side airbags in an effort to receive a higher safety rating for their vehicles. Today, front side impact airbags are included on most if not all foreign and domestic manufactured base models. 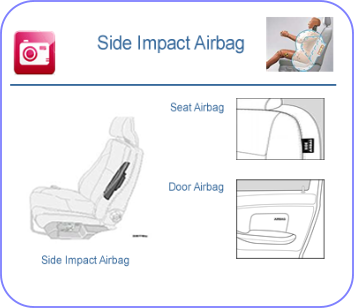 During a side impact collision the side airbags protect the head, neck and torso. Eventually, as depicted in the curtain airbag illustration above, the entire vehicle will fill with airbags leaving no doubt that the technology of side impact airbags has greatly reduced life threatening injuries. Transportation Secretary Mary Peters said. NHTSA estimates that the rules will add about $33 to the cost of a vehicle. Side-impact passenger vehicle crashes are often severe. They account for 28 percent of all fatalities, the majority of which involve a brain injury. Safety advocates have long urged NHTSA to require automakers to do more to protect motorists in side crashes. Rear seat protection For the first time, NHTSA will also require automakers to provide head protection for rear seat passengers in any crash. “With these rigorous new requirements, we are building on the strength of innovative and life-saving side impact technologies that are already available to many new car buyers,” NHTSA Administrator Nicole Nason said. The Insurance Institute for Highway Safety has reported that its research demonstrates that head-protecting air bags reduced driver deaths by 52 percent in sport utility vehicles and 37 percent in passenger cars. NHTSA initially first proposed side-impact standards in May 2004, roughly six months after automakers voluntarily agreed to install side air bags by 2009. The agency reopened the regulatory process following questions about the crash test procedures automakers intended to use. Important first step Public Citizen's Shull said the new standards will help ensure that automakers design vehicles to protect more people from more types of side-impact crashes. Automakers will now have to build vehicles to protect people from side-impact collisions not only with other vehicles but also with stationary objects (such as trees and other objects on the road). Vehicles will be subjected to a tougher performance test that integrates two kinds of testing: dynamic pole tests, representing side-impact crashes with stationary objects, and movable deforming barrier (MDB) tests, replicating side-impact crashes with other vehicles. Previously NHTSA tested using only MDB tests.